Snowy owl (Bubo scandiacus) is an owl occurring in the tundra around the Arctic coasts. It is found in Greenland, Alaska, Canada, Iceland, Scotland, in the Scandinavian mountain chain, Finland, and Russia. Most breed in Siberia, Alaska and Canada and only a handful in Europe. The Snowy Owl nests above the tree line, on heaths and similar vast, open areas with slightly undulating terrain. The bird places its nest on the ground that consists of a uppskrapad pit on top of a pile of stones, but it can also nest in abandoned eagle nests. Snowy owls live almost exclusively on rodents like lemmings and voles, but sometimes also takes birds, especially grouse. TAGS: Bird painting of Snowy Owl, bird sketch of Snowy Owl, bird drawing of Snowy Owl, bird art of Snowy Owl, bird illustration of Snowy Owl. The Eurasian Pygmy Owl (Glaucidium passerinum) can be found in Northern and Central Europe, and east to Siberia. The Barred Owl (Strix varia) is a large typical owl native to North America. The Short-eared Owl (Asio flammeus) has a very large range and is found on all continents except Australia and Antarctica. It breeds in North America, the Caribbean, South America, North and Central Eurasia and the Pacific. 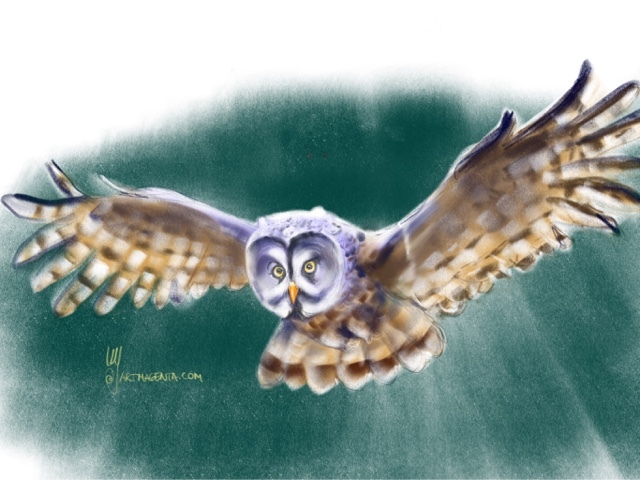 TAGS: Bird painting of Short-eared Owl, bird sketch of Short-eared Owl, bird drawing of Short-eared Owl, bird art of Short-eared Owl, bird illustration of Short-eared Owl. Ural Owl (Strix uralensis) has a similar shape of a larger variant of the tawny owl. It is a resident bird with a large distribution in Europe and northern Asia, from Sakhalin, Japan and Korea in the east, to Scandinavia in the west. The Eagle owl (Bubo bubo) has an Eurasian distribution and is present in the North-Eastern and Southern Europe and in much of Asia. The burrowing owl (Athene cunicularia) is a small, long-legged owl found throughout open landscapes of North and South America. The little owl (Athene noctua) is a bird that inhabits much of the temperate and warmer parts of Europe, Asia east to Korea, and north Africa. The Lapland Owl also called the Great Grey Owl (Strix nebulosa) is an owl that is almost as large as the eagle owl. The Lapland owl has a relatively circumpolar distribution. It breeds in North America, from Lake Superior to Alaska's Pacific coast, and from Scandinavia and eastward across northern Asia. The Barn Owl (Tyto alba) occur over large parts of the world, on every continent except Antarctica. The owl is a resident bird and stays in the same area from year to year. The long-eared Owl ( Asio otus) nests in Europe, Asia and North America. Mostly they are migratory birds. The Boreal owl (Aegolius funereus) is also known as the Tengmalm's Owl after Swedish naturalist Peter Gustaf Tengmalm. 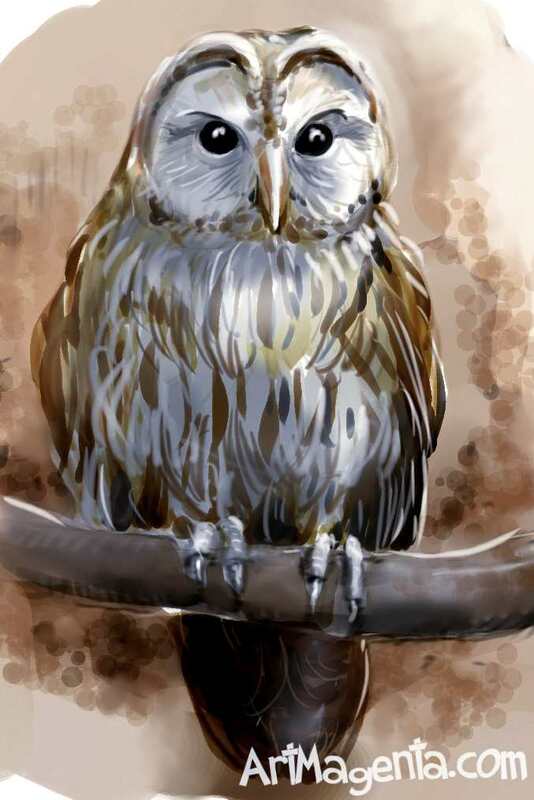 The Boreal owl nests in dense coniferous or mixed forests of northern Eurasia and North America, and in mountain ranges such as the Alps and the Rocky Mountains. The Great Horned Owl(Bubo virginianus) is an American owl.